The calculator is cased in black plastic, with 35 buttons and an on/off switch on the front panel. Its display is composed of 15 red LED digital "letters". On the back, there is a panel that can be removed, giving access to the battery. Unfortunately, the battery pack is missing, but from the size of the space, it would have been about the size of three AA batteries. The grey plastic case also contains a number of accessories. A black leather pocket to hold the calculator, with a belt loop on the back also contains a 22 page, spiral bound, quick reference guide. A 2m long cable connects a Singapore made US AC power adaptor to the calculator or a battery recharging unit. The prongs of the adaptor have been bent to fit a Australian power socket. The 60 page manual is also present in the case. 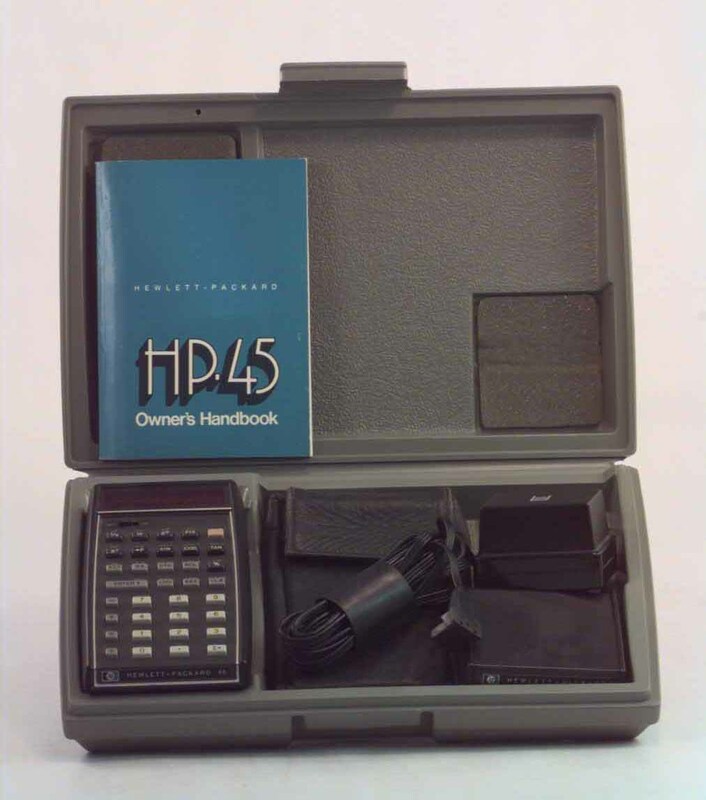 The HP-45 uses what is known as the "Reverse Polish" or Lukasicwicz (Loo - ka - sh - evich) algorithm to evaluate mathematical expressions entered into it. This method differs substantially from that employed by typical pocket calculators today. The most visible difference is in the method one enters in an expression to be evaluated. For example, to evaluate "2+2" one keys in 2, enter, 2, +. The calculator operates using a "stack" of four variables: X, Y, Z & T. As a number is keyed in, it is placed in the X register, the contents of which is displayed on the screen. When enter is pressed, this number is copied into the Y register, pushing the data in Y into Z and the data in Z into T. A new number can then be keyed into the X register. Pressing "+" then adds the contents of X and Y together, the result being copied to the X register, where it is displayed. The contents of the stacks can be easily cycled through, or swapped allowing for complex manipulations of data. At the time, Hewlett Packard claimed that Reverse Polish was the most efficient algorithm for evaluating mathematical expressions known to computer science. Reverse Polish calculators are still used by many today, with some adherents claiming that, given a Reverse Polish calculator, they can evaluate any mathematical expression faster than a person with any other type of calculator. This particular calculator was purchased by Dr BJ O'Mara in America in the early seventies, costing several hundred dollars, making it one of the first "affordable" pocket calculators. Thus the demand for this model was so great that Dr O'Mara had a wait of several months for delivery of his HP-45.